Since its launch in 2009, the RCN Bulletin Jobs Fair has guided thousands of nurses into promising careers all around the UK. Could you be the next nurse to benefit from attending this fantastic fair? Organised by the events team at RCNi, the RCN Bulletin Jobs Fair started life as a London-based fair held at the Business Design centre in Islington. The fair was an instant success, with many nurses interviewing and receiving job offers on the day of the event. As well as bringing together the top nursing and healthcare employers, such as NHS Trusts, the Army, private health companies, charities and recruitment agencies, we organise a regular timetable of free seminars throughout the event. These seminars run every hour and range from career advice and CV clinics to talks about revalidation, and how to shine at interviews. We also listened to feedback from nurses and expanded the reach of our recruitment fair, taking the RCN Bulletin Jobs Fair to Manchester, Glasgow, Leeds and, this year, we are delighted to add Birmingham to our schedule. Jobs Fair is the place to visit for nurses at all stages of their career; from experienced nurses to students. Meet employers with immediate vacancies and keep up-to-date with the latest recruitment news in the industry. 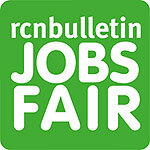 Nearly 20,000 nurses have visited the Jobs Fair events over the past six years. Invigorate and start your career by coming along. Register on the website for free entry.